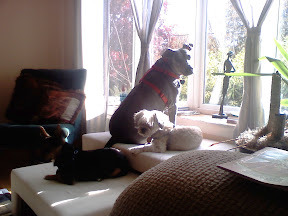 Suede asked Jake & Ellwood Blues to handle this post...but they have the same problem she does - no opposable thumbs, so again I will take dictation. We wanted to let you know that the Pedigree Adoption Drive Blog Hop, which ended September 19, was a success with over 400 bloggers posting about the drive to feed the 4million sheltered dogs. Pedigree is donating a 20 pound bag of Healthy Longevity Food for Dogs for every blogger who participated in the blog hop. But the giving doesn't end there. Even if you are not a blogger or didn't participate in the blog hop, you can still help feed sheltered dogs. 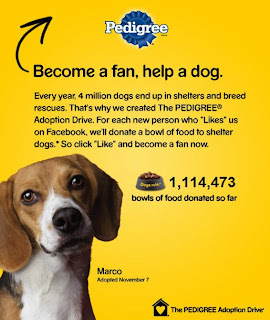 Between now and December 31, 2010 for every person who "fans" or "likes" the Pedigree Adoption Drive on Facebook, Pedigree will donate one bowl of food to selected shelters. Then share this on Twitter by using the hashtag #dogsrule so we all know that you clicked to feed a dog and that you are encouraging others to do the same. Click that button and let Pedigree know you "like" them by becoming a "fan" on Facebook. Thank you for visiting my blog. I am glad to know that you are interested in animal-related content. 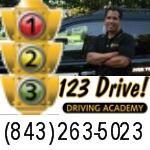 I will definitely follow you on Twitter also. I think this is a great program because it really is so simple...and since so many dogs need food...it's a great way to feed them.